Computer glasses (sometimes also called gaming glasses) are particularly designed to optimize vision, filter away blue light, remove glare and provide comfort during your workday. Read and find out how an anti-glare coating, this simple eyewear technology on the lenses can resolve most eyesight problems related to computer usage. Computer Vision Syndrome: What is computer eye strain? How to protect eyes from computer blue light? To buy computer glasses or not? Computer glasses is also called Gaming Glasses! So gamers if you’re reading, read to the end! Read on to learn more about 2017’s trending line of computer glasses online that promises you the latest fashion in eyewear, besides finding a pair of eyeglasses that provides comfort while working on computer or any digital electronic screens. Learn the basics of these yellow tinted glasses that reduces eye strain and headache. 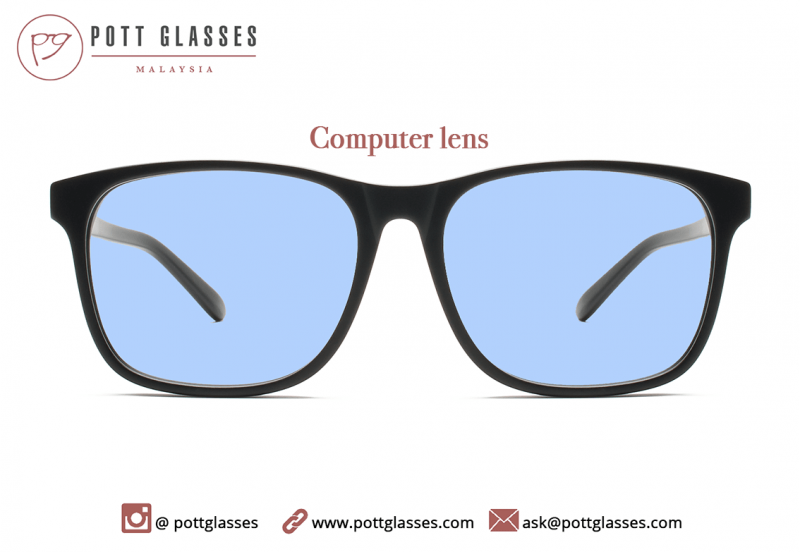 Basically the fitted lenses comes with anti-glare coating to protect our eyes from Blue Light from digital displays. Learn the vision issues that resulted from using computer or looking at smartphone screens for long hours. Who Must Read? You wonder whether: Are there glasses for computer use? Additionally, you have symptoms like red itchy eyes, blurred vision, fatigue, back and neck pain, headache and dizziness from using computer or looking at smartphone screens for long hours. #2: Computer Vision Syndrome: What is computer eye strain? The unsafe Blue Light radiated from PC can unfavorably influence your vision. In 2017, Computer Vision Syndrome (CVS) is now a common problem due to the widespread use of mobile devices and computer usage. 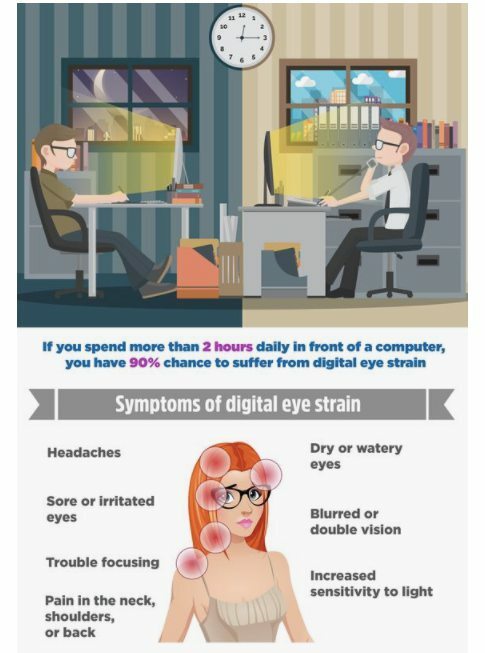 Learn the issue of digital eye strain and what happens when we use computers for long hours. Who Must Read? You suffer when you are using computer at work or just by looking at your phone screen. 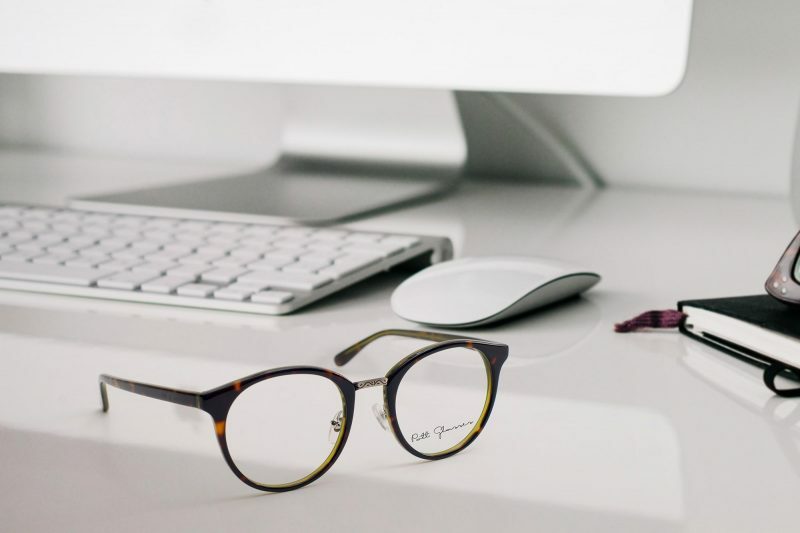 You question: Do reading glasses help with computer eye strain? Can you get glasses for eye strain from computer use? Read On: Computer Vision Syndrome: What is computer eye strain? The glare from electronic devices is harmful to our vision. The digital display screen on computers, phones or TV emits Blue Light. The regular side effects are blurred vision, red eyes, migraine, itchy eyes and eye strain. Find out if anti Blue Light coating on computer lenses help relieve eyestrain. Who Must Read? You have questions such as: Do blue light lenses work? Does the Anti-Blue Light coating help relieve eye strain? 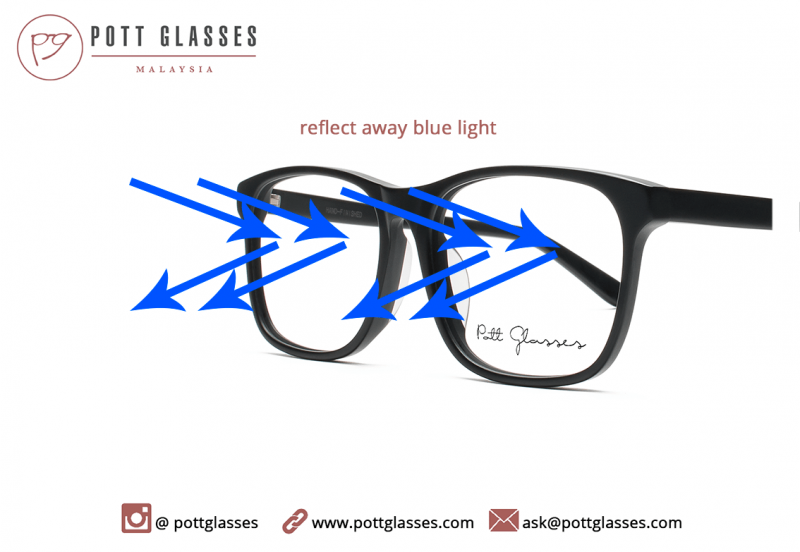 Read On: Do Anti Blue Light Glasses work? #4: How to protect eye from blue light? To buy Computer Glasses or not? Working on a computer has turned out to be an essential piece of the present way of life. Computer Vision Syndrome (CVS) has turned into a typical issue because of steady and long hours of gazing at the screen of high-tech digital gadgets. There’s an answer for this: Also known as gaming glasses, they are eyeglasses that vary from normal spectacles because they have added feature that aids in looking at a computer screen with more comfort and reduced strain. Who Must Read? Do I need anti glare coating on my glasses? If you use a computer frequently and experience those digital eye strain symptoms, you might want to read on. Read On: How to protect eye from blue light? From computers to mobile phones, constant usage of electronic screens can harm your eyes significantly. Nevertheless, protect and shield your eyes against Blue Light with Anti Blue Light glasses that is intended to provide safety and optimize our vision for working on digital devices in today’s high-tech world. 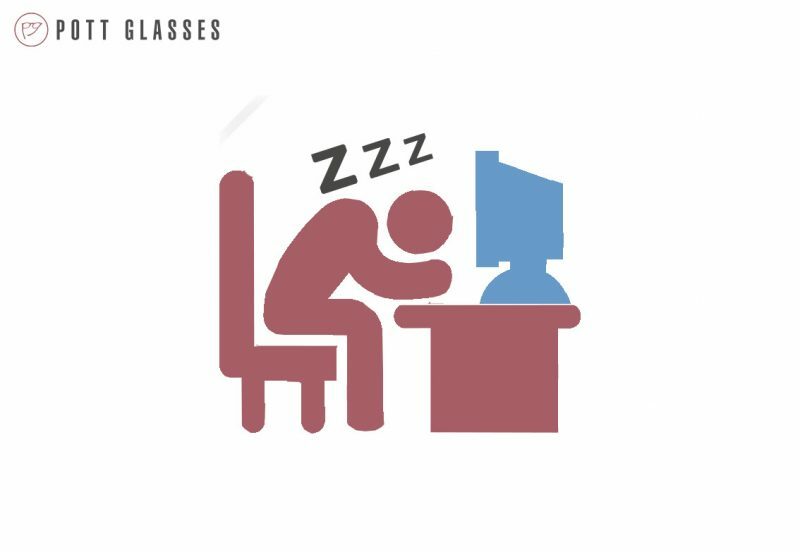 If you don’t want to rely on these ‘gaming glasses‘, learn this simple guide on relieving eye strain from computer usage. Who Must Read? 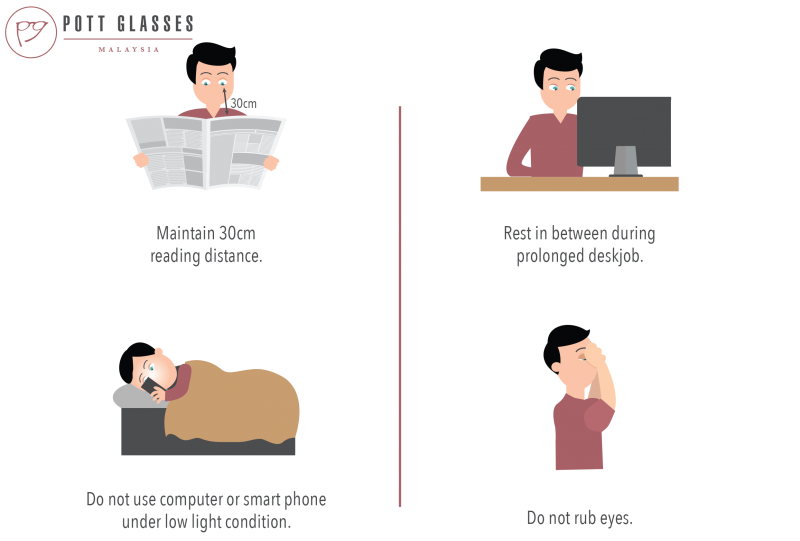 Read on to find out how to relieve computer eye strain besides using computer glasses. #6: Why wear computer glasses? We can’t deny how effective and helpful using a computer and smartphone is. It has changed us completely. Meantime, long hour of computer time can truly hurt our eyes. This is the motive behind why such glasses is gaining widespread recognition now. Who Must Read? Read if you need to know why we need computer glasses if we stare at a digital screen for more than 2 hours daily. Read On: Why wear computer glasses? If you’re interested to get a pair of computer glasses, kindly make an appointment with us by filling the form below. You’ll be entitled RM 35 discount upon making the appointment.